1. The Bangor Folk Festival is where it's at. Mainers are the cutest things. None of them can dance, and none of them know it. So cheerily enthusiastic! So bobbing-around! So droll! In their button-down shirts, long-sleeve cardigan pullovers, moccasins, dredlocks, and Gandalf beards! Pretty Lady apologizes for all the toes she trampled, yesterday. It was quite impossible to avoid. • Recommended: Grupo Fantasma. Utterly, irresistibly danceable. Pretty Lady is listening to them as we speak. Tra-la-la-la. 2. Water lilies grow wild. Pretty Lady did not believe this was possible. Secretly she still suspects that the State of Maine sneaks around at night and plants water lilies in all the lakes and ponds. But her cuñado swears that they grow there all by themselves. Also the pitcher plants and sundews. It gives one pause, however, to reflect that where carniverous plants grow thickly, there also must be the mosquitoes to feed them. Fortunately, today was mildly breezy and mildly chilly, just the day for a kayak round the bog. 3. Bald eagles still exist. We saw one! Just actually today! Paddling through the water lilies, past the pitcher plants, cat-tails, cranberry bushes, and sundews! It was quite an overwhelming moment. 4. One does not ride in a kayak. One wears one. It's rather like being a Monopod. There is a little thing you put on, called a 'splash skirt' (which is most dorky and unattractive.) Then you put on your kayak. You squeeze your hips into it, and adjust the little pedals to your leg-length, so that you can dip the whole kayak by twisting your hips. When you paddle, you are not moving it with your arms; you are holding your arms straight and pushing against the water with your latissimus dorsi. It is all very splendid, like being a different sort of creature altogether. In fact, it has been quite a Dawn Treader day. 5. 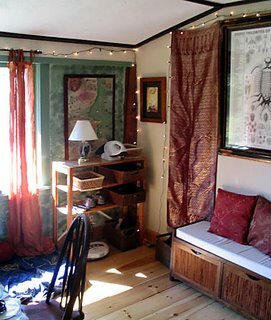 'Cozification' is a survival skill. inspired, partly, by a work of literature which made a profound impression upon both of our psyches, at an early age. 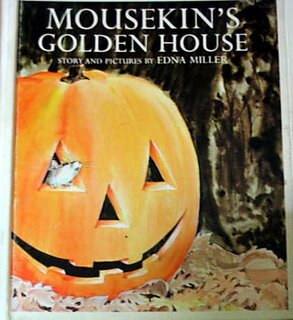 For those of you unfamiliar with this great work of art--the mouse builds a feathery nest inside the jack-o'-lantern, the snow comes down, the pumpkin closes its eyes and the mouse is all snuggled up in a round orange room, asleep. This is the sort of thing that one thinks of, on those rare occasions when one is plagued with insomnia. Works better than drugs. Pretty Lady apologizes for not getting photos of the lilies, the carniverous plants, or the bald eagle. Cameras and kayaks, sadly, do not mix. Now that it is raining, however, as it evidently does quite often here, perhaps she will snuggle down in her new Library Loft and do some scribbling. Or perhaps a nap. Sounds like a little 'refreshing of the soul' going on there. Good stuff! Looking forward to November, when I can do the same. PL, I recommend Monhegan Island if you have an opportunity to go there while in Maine. It's absolutely one of the most beautiful places that I've visited. What the hell is a "cardigan pullover"?? The loft is beautiful. 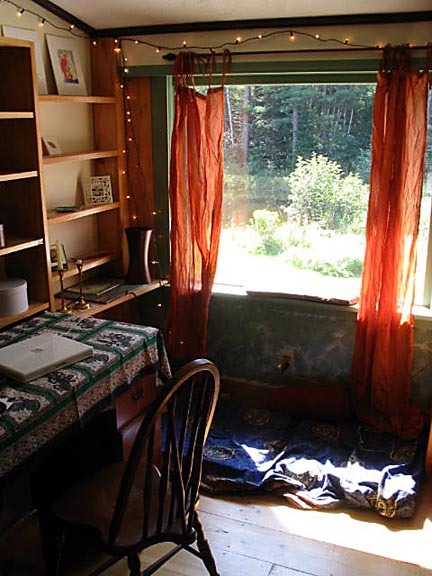 I want to write more, to gush and wax poetic about the beautiful pine flooring, the wonderful choice of fabrics and the play of light through the windows. But I'm working on deadline.